【Mar. 13th－15th】 The 15th Short Field Visit was held successfully. The 15th Short Field Visit was held successfully. The 15th Short Field Visit took place between the 13th and 15th of March, 2017. Nine people, including six graduate students and three faculty members participated in an on-site study at the Japan Atomic Energy Agency (JAEA) and Chiyoda Technol Cooperation. On the morning of March 13th, they observed the Nuclear Emergency Assistance and Training Center and learned about risk communication and the management structure that JAEA employs. In the afternoon, they visited the “JAEA Nuclear Fuel Cycle Engineering Laboratories” to observe an “Engineering Scale Test and a “Research Facility (ENTRY)”, the “Quantitative Assessment Radionuclide Migration Experimental Facility (QUALITY)”, the “Plutonium Fuel Third Development Section”, and a “Chemical Processing Facility (CPF)”. On March 15th, they observed the film badge production process and the site for radiation dose measurement at the Chiyoda Technol Company’s Ohnukidai Office. 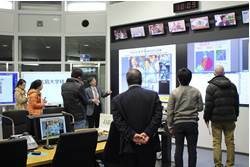 Following this they also visited Chiyoda Technol’s calibration facility at the. Oarai research laboratory.